This paper explores and discusses the implementation of multimode, subtractive-additive, robotic production methods. 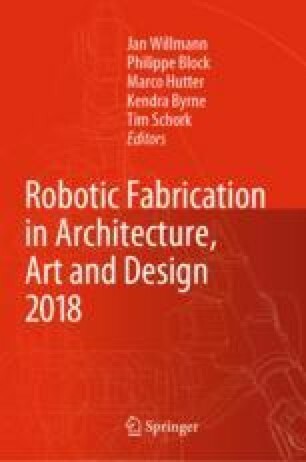 The research addresses the opportunities and challenges in the integration of subtractive and additive robotic manufacturing routines for architectural scale applications. It specifically presents a customized computational design to robotic fabrication workflow of a material system composed of subtractively produced expanded polystyrene and additively manufactured silicone. The integration of these two sets of production methods allows for a symbiosis of hard and soft materials. Through initial case studies and a pilot subtractive-additive prototype, this paper discusses how multimode robotic production methods, with the goal of purposefully expanding the potential of isolated fabrication techniques, results in multiscale and efficient design materialization. Furthermore, this paper demonstrates the design, computation, materialization, and prototyping process of a chair project with multiple materials in more detail. We acknowledge the essential contributions of all current and former members of Robotic Building team and Henriette Bier, Dessau Institute of Architecture as well as Hyperbody group at TU Delft. We would also like to thank MSc students at BK City of TU Delft and M. Arch students in DIA at HS Anhalt, who have contributed to the design, research and production of some of the background works discussed in this paper. Further, we thank Evelyn Fischer and Sean Eddings for their kind proofreading of the text. We would also acknowledge the support of ABB Benelux and KUKA Benelux in some of the presented projects.